Lighting designer Rick Fisher has chosen ETC‘s Selador Desire LED fixtures to help light David Hare’s The Judas Kiss at the Duke of York’s Theatre. 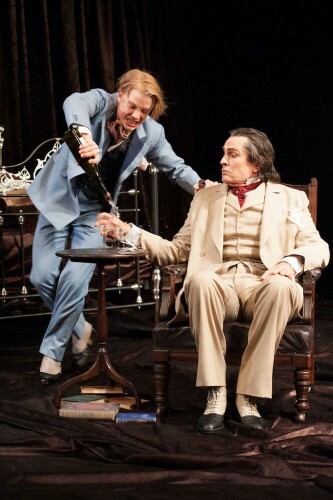 Set in 1895, Hare‘s play tells the dramatic true story of the betrayal, imprisonment and downfall of famed playwright Oscar Wilde. “For the kind of work I’m doing – a subtle piece with the lighting concentrating on moods, emotional states and times of day – I wanted lighting which doesn’t draw attention to itself,” says Fisher. “The Desire fixtures give a very nice, natural looking light, which was a pleasant surprise and a real advance.” The best thing, from a lighting designer’s point of view, Fisher explains, is that no one noticed the difference between the Desire LED and conventional fixtures in the hybrid lighting rig. “I had been using conventionals on the show while it was on an initial five week tour,” explains Fisher, “but wanted the chance to do a bit more than colour scrollers offered me.” Colleagues recommended the Selador Desire, which has a seven colour mixing system. “It was important that the colour looked natural,” he continues, “and that even if we used a wider than usual colour choice, it didn’t ‘look’ LED. I used the Seladors mostly for the scripted sunset and then sunrise that happen throughout the second act, and the LED allowed me to be a bit more extreme. Previously, when we were on tour with conventional lights and scrollers, I didn’t have such a wide range available. The Selador Desire D60s, hired from White Light, also fit well into a tight space. As he says: “There were very few places to put fixtures at the angle that we needed for low sunlight, and I only had a very narrow gap to get light through, so the Seladors Desires were great. I was able to use two units from a perch position to be able to continue the same light quality into the acting area.